Old Definition: A liquid byproduct of churing butter. New Definition: Dairy product made by adding a lactic acid bacteria culture to skim or non-fat milk. 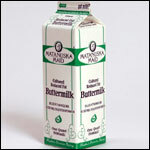 The milk is then fermented to make modern buttermilk.